In the 1920’s, folks of the Brackett Town valley would walk across Vein Mountain to take the Peavine Railroad, a steam locomotive and narrow gauge rail that went from Old Fort to Spartanburg, SC. (The railroad depot museum in Old Fort tells the story well.) When the textile mills opened up in Rutherford County, “people would take the train down and board at someone’s home and then come back for the weekend.” Henry rode the train to visit Lela Lawing when they were courting, and after they were married in 1927 and settled in the Sprouse Home, Lela took that same train to visit her family in Spindale. But her brother John lived down the road. (Eckenrod’s Studio on Court Street had a recent exhibit at MAACA with old photos of the county including the trains. )Then came the age of the automobile for the working man, and train travel had competition in this sprawling country. But in this neighborhood, folks walked to church. Henry may have been taken to the Methodist Church in Dysartsville by his mother, Miz Nor, but his new family would worship over the hill at the Macedonia Baptist Church established in 1887. And he was buried there in the Sprouse family plot in 2002 next to his wife Lela Lawing Sprouse (who died in 1987) near his Uncle Charlie Sprouse (who died in 1926), and his sister Maggie Sprouse Arrowood, (who died in 1929). Maggie’s oldest boy, John Wilson Arrowood, died at age 13 in 1932. Six months later his father’s second wife Hessie Lewis lost her new twins and died the following month. 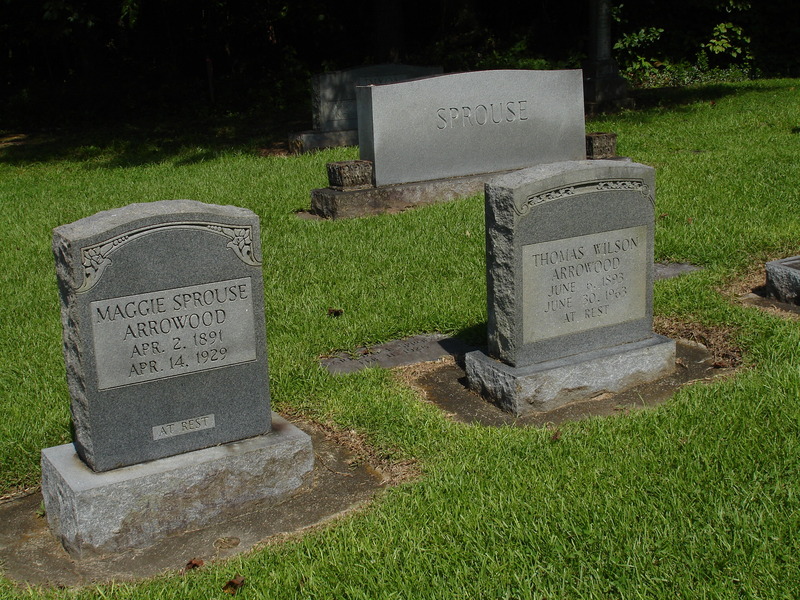 Her husband, Tom Arrowood, who died in 1963, is buried next to his first wife Maggie behind his son John. And among the other families with deep roots in the community. The Gallions, the Radfords, the Connors, the Lewises, the Rhoms, the Lawings, the Arrowoods. Roots that sought eternal values and not worldly goods. In 1930, the year his grandson Larry was born, JJ Sprouse moved into the kind of house his family would have had in the old country of Scotland. The Scotch-Irish brogue still colored his speech. (Nora and sister Mavis travelled there years later and saw the prototype.) It was a shelter over two tunnels burrowed into the Brackett Town creek bank. One had an outside entrance, and JJ would find respite there from the hot summer sun. He furnished it with a cot and a miner’s lamp for his afternoon breaks. There was another tunnel that could be entered from the kitchen area. This was his refrigerator, especially for dairy products. “There was a little lower level where the cornmeal poured out, and then up a set of ten steps there was an upper level where all the machinery was running and grinding. And I’ve seen him go up there and pour two, three bushels of corn in that hopper and then go down where the cornmeal came through a chute that comes out of the wall, and you put your sacks on and tie them to catch the cornmeal. He’d rap the box to vibrate and make the cornmeal slide down. And I was always trying to get loose, beggin’ to get loose, but he never did. Minute we got up the road a few feet, he’d turn my hand loose, and I could run along in front. In that mill he’d never let me go because he knew what would happen. I’d be ground up. Cornmeal made out of me.” Brice didn’t mention the activities enjoyed in the other buildings. In addition to the grist mill and the sawmill, there was a shingle mill, a threshing house, and a cider press. This entry was posted in Brackett Town Saga. Bookmark the permalink.